In January, 2014, a group of friends and former co-workers came together and decided to see if they could get licensed to make small batch liquor. They all had a commitment to American manufacturing and a love of liquor, so opening a distillery seemed like the thing to do. They found an old mill that needed to make an American product again and set out to obtain a license. Southern Grace Distilleries was licensed in September 2014. The mission of Southern Grace Distilleries is to create American distilled spirits meant to recapture the excellence of days gone by when Made in the USA meant Best in the World. We want to combine that with the soul and taste of the best of the South to craft distill very small batches of moonshine and whiskey. Every batch and bottle is hand labeled and numbered, and nothing leaves our shop until it is a spirit we’d be proud to serve on our own back porch to our family and closest friends. 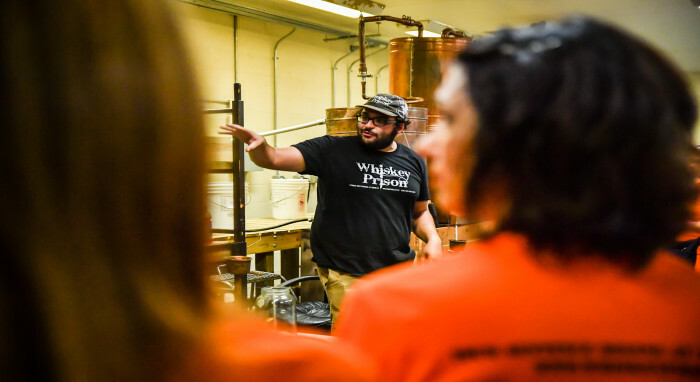 Located inside a former prison, experience a tour of Southern Grace Distilleries and taste the award-winning spirits produced onsite.